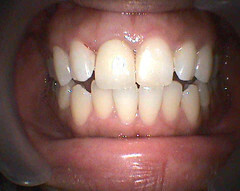 Dental treatment has moved towards aesthetics and cosmetics in the recent years.Dental material have also revolutionised to enable us as dental professionals to produce very aesthetically pleasing restorations on our patients.And for me,it is always most satisfying when my patients return to me or write to me to tell me how pleased they are with their new smile. 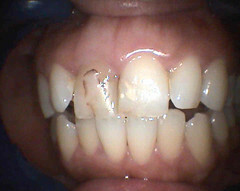 This is the case of Aireen.She has been walking around over the last few years with a badly discoloured front tooth which was previously root-canal treated.And she has some unaesthetic restorations placed on her two front teeth. Aireen is seated 2nd from the right.Hey,Aireen.You look lovely! I came to your website via Loopymeal@Jame’s blog. It’s nice to visit a malaysian dentist’s blog for a change as I’ve been frequenting overseas’ dentists’ blogs. I find your blog very insightful and inspiring, hence I’ll be re-hitting the books after this. hehe, my exams are in three weeks. By the way, I’m a 2nd year dental student in AIMST(have u heard of it? It’s in Kedah) and I hope to be able to ask you questions regarding my studies in the future and for the mean time, I’ll be looking up to you as a source of inspiration! My dream is to open my own clinic one day too. :) But I plan to work for bigger clinics or even hospitals..private, after the 3 years of government service…before I open my own place. How are you involved with UM’s faculty of dentistry? Are you also a lecturer? Hi Jean, what a great transformation, my sister has tooth discolouration as well and may need root canal work done, get her to see you when she comes back to KL. Great job on the filling Doc. Enjoyed the wifi music. Had a totally refreshing experience. Good that you’re not following the “norm”. Definitely will recommend my family and friends to you. Hi Jolene,nice to know you.Do enjoy your years in dental school and learn as much as you can.There will me much more to learn when you come out to work.I am still learning everyday! I used to teach part time in the dental faculty in UM some years ago,but I have always been in touch with the students via the Christian fellowship. Hey Lil,you would need to crown your root canal treated tooth because bleaching will not work as it only bleaches the enamel layer. Ameloblast,that is composite on the right and a post crown on the left. Hi Mae,thanks for your comment.Will catch up with you soon. Justin my friend and kampung/school-mate.Really appreciate your comment and that glowing testimonial.